December honors more Old Testament saints than any other month. Many Old Testmant prophets and others are honored by the Orthodox Church. In most cases they prophecied something to help identiry the Christ when he took flesh. In other cases the indivduals were ancestors in Christ's family. Since December is commemorates the Nativity of Christ more Old Testament saints are honored than during any other month of the calendar. The Holy Innocents mentioned in the Gospel reading on December 26 could be seen as Old Testament children slain in the attempt to kill Messiah or as the first New Testament martyrs. Nahum (December 1) - Romans 10:15 quotes Nahum for those who bring 'good news' and the last chapter foreshadows the sins of wicked Babylon in Revelation. Habakkuk (December 2) - the Lord's words to Habakkuk on the need for patience and faith for His answers to come are quoted in Hebrews 10:37-28. Zephaniah (december 3) - he foretells the future Church which welcomes all nations (2:11) from the 'islands'. Prophetess Hannah (December 9) - Hannah's prayer for a child (Samuel) has many similarities, including her humble attitude, with the Magnificat/Song of Mary (Luke 1) prayer of the Theotokos (1 Kings 2). Haggai (December 16) - his vision that those of all nations will come to the 'Desire of All Nations' in a temple that is more glorious than the first is reflected in the latter chapters of Revelation. Daniel (December 17) - many prophecies of Daniel (particularly chapters 7,9,11 & 12) reference the Second Coming of Christ and the event surrounding it. Christ specifically referenced his prophecies in Matthew (16 & 24) and Mark (13 & 14). The seventy weeks (490) years from the decree to rebuild Jerusalem by Atraxerxes complete around the the year AD 33, when Christ was crucified. Holy Youths (December 17) - Ananias, Azaris and Misael were the three youths case into the firey furnace by Babylonian King Nebuchanezzar. Their example of faithfulness to God as referenced in many prayers and antiphons of the Orthodox Church particularly the 'Song' in Daniel 3. Nathan (Sunday before Nativity) - although he does not have a separate feast day, his prophecy in 2 Samuel (Kings) 7 deserve special note because he reveals to King David that God will establish His kingdom from David's heirs and that it will last forever and the ruler will be His (God's) son. Ancestors of the Holy Fathers (Sunday before Nativity) - the geneology of the Lord from Matthew (1-25) which includes Abraham, Isaac, Jacob's sons and the kings and others up to St. Joseph the spouse of the Theotokos is read. While the geneology of Luke 3:23-38 is not read, the names (including Adam) are honored on this day by the Church. David and Joseph (Sunday after Nativity) - King David and St. Joseph the Betrothed of the Theotokos are commemorated (along with St. James the brother of the Lord) on this Sunday. David whose book of Psalms is a key element in Orthodox worship and St. Joseph whose faith and obeidience to God protected the Virgin Mary and the baby Jesus before and after His birth are both bright Old Testament lights shining still shining in the New Testament era. Malachi (January 3) - the book in the Old Testament records the prophets predictions of the coming of the Forerunner and Christ as well as Christ the Judge at the Second Coming. Shemaiah (January 9) - the prophet in 2 Chronicles 11 who told Rehoboam not to attack the Northern Tribes of Israel after the death of Solomon. His connection to the New Testament is not clear although through his obedience King Rehoboam preserved his life as a descendant of the the Lord Jesus. Azariah (February 3) - his words to King Asa in 2 Chronicles 15 reflects the message throughout the New Testament: "The Lord is with you while you are with Him. If you seek Him, He will be found by you, but if you forsake Him, He will forsake you." Zechariah (February 8) - the Book that bears his name contains many prophecies about Christ including his entry into Jerusalem on a donkey, the betrayal for 30 pieces of silver, the darkness that began at the Crucifixon and His piercing by the lance. Joad (March 30) - the prophet in 3 Kings 13 who denounced Jeroboam for his setting up idols in Bethel and Dan, who healed the withered arm of the king when he threatened him and who disobeyed the Lord's command to neither eat nor drink anything until his return home. Specific connection to the New Testament is not clear. Isaiah (May 9) - there are more New Testament prophecies in the Book of Isaiah (particularly chapters 7, 9, 11, 40, 50, 53) than any other prophetic book. It is Isaiah who prophecies that the Messiah will be born of a virgin and gives many details about His Passion. Elisha (June 14) - mentioned by Christ in Luke 4, the similarity of the nature of his miracles (multiplying food, power over natural elements, healing leprosy and raising the dead) to those of the Lord Jesus shows the power of Christ is timeless (Hebrews 13:8). Amos (June 15) - chapter 9 prophecies the return of Israel from being scattered among the nations as well as the 'Gentiles who are called by My name', a clear reference to the Church. Elijah (July 20) - his hermetic lifestyle of strict fasting and prayer in the wilderness provided an inspiration for the development of monasticism. His role in the Transfiguration and at the future Second Coming give him an active role in the Church. 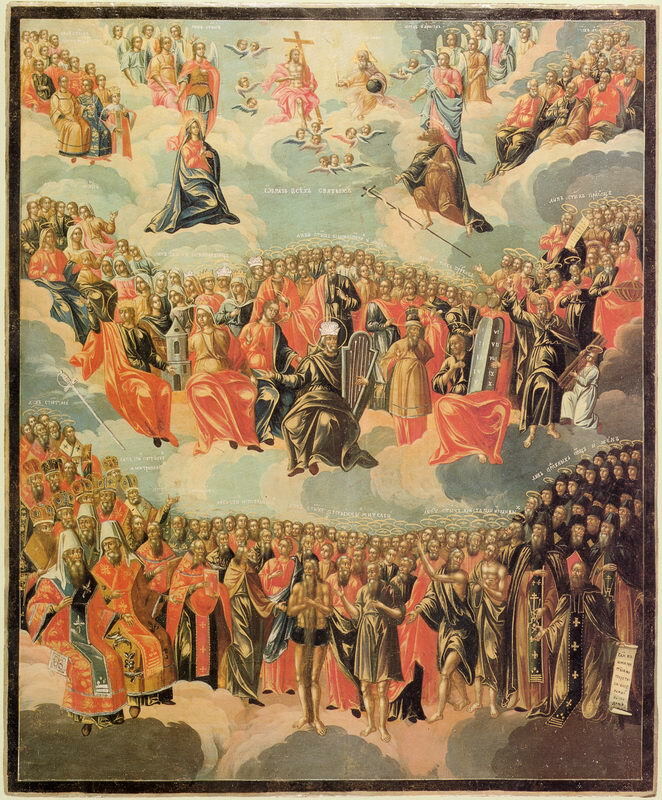 Ezekiel (July 21) - Ezekiel's vision of the 'dry bones coming to life (chapter 37) preifgures the resurrection of the body as well as the restoration of Israel at the Second Coming. Most of the allusions, including the vision of heaven, from Ezekiel are found in the Book of Revelation. Holy Maccabees (August 1) - Elder Eleazar, the seven Maccabee brothers and their mother all died rather than sacrifice to false idols and deny their faith. They are praised as precursors of the Christian martyrs who died to the Faith. Samuel (August 20) - the prophet was sent by God to anoint David King of Israel though he was at that time a young shepherd whose descendent, Jesus Christ, would be God in the flesh and rain forever. Moses (September 4) - the author of the first five books of the Bible (Pentateuch) and the man chosen by God to reveal the Law to Israel appeared in person at the Transfiguration. He and his writings are frequently referred to by the Lord. Jonah (September 22) - Christ gave Jonah's three days in the belly of a whale as an image of His coming three days in Hades and stated that the pagan Ninivites responded better to God's call than the Jews of His time. Baruch (September 28) - the scribe of Jeremiah gives one of the clearest prophecies that reveals Christ to be God: "He was seen upon the earth and lived among men" (3:36). Hosea (October 17) - there are several allusions to Christ's ministry in his writings but the prophecy that Christ would be 'called out of Egypt' (11:1) is clearly referenced in Matthew. Joel (October 19) - Peter reveals that the outpouring of the Holy Spirit at Pentecost with the miraculous ability given the disciples to speak in languages they previous didn't know as well as other spiritual gifts were what Joel wrote about in his prophecy (chapter 2). Ahijah (November 12) - Ahijah prophecied of the division of Israel (ten tribes) and Judah following the death of Solomon, the eventual extinction of Jeroboam's family line and Israel's eventual deportation. He is one of the few prophets honored by the Church with no clear connection to the New Testament. Obadiah (November 19) - this short book contains the prophecy that all neighboring nations that oppressed Israel would cease to exist (16) and that the Lord's future judgement would go forth from Mt. Zion.